A honeymoon is the beginning of your journey through life together as a married couple. Where you go, how you go and with whom you plan your trip will define what should be the experience of a lifetime. 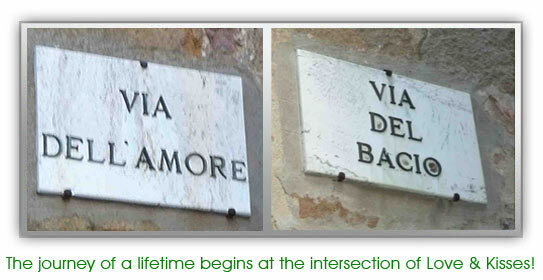 Italy is for lovers and Bespoke Travel is the essence of individuality! Traveling in style means different things to everyone, which is why a Bespoke Honeymoon is what every couple dreams of for their journey. Your personal interests are always top of mind for us, while we create the magic that can only be experienced in Italy. Honeymoons Amore e Baci is the Bridal Registry for those who want what they want! China and crystal may not be the preferred items for your registry when a "life changing" trip to Italy can be the gift of choice for your guests. Enjoy the Now while La Dolce Vita awaits you.